Cosmetology school drop-out Scarlet Patterson needs a job—any job. So when her best friend and award winning monster makeup artist Derek Keyes scores her a gig on Romeo George’s new zombie flick “Isle of the Living Dead” she’s on the next boat to the remote desert island set, makeup brushes in hand. The good news? The movie stars her longtime childhood crush—action star Mason Marks (of “Sparkly Vampires from Hell” fame). The bad? It also stars his current made-for-tabloids girlfriend—the trashy Cissy Max—who seems determined to make Scarlet’s life a living hell. But that’s not the worst thing. Not by far. Because all those zombie extras stuck on the desert island alongside her? Turns out they don’t need any makeup to look the part. And they’re always hungry. Really, really hungry. As the horror movie set is transformed into a nightmarish reality show—where everyone wants to be kicked off the island—it becomes up to Scarlett and Mason to star as real life action heroes and figure out a way to save the world. And maybe even the paparazzi. Filled with action, humor, romance and, of course, plenty of braaaains. Originally published as part of the "My Zombie Valentine Anthology." Scarlet needs a job and when her best friend Derek gives her a chance to make some money on his most current monster movie she goes for it. She may have had to drop out of school but she is following in her grandmother's footsteps as a makeup artist. The star for the movie happens to be her childhood crush but he's starting in the movie with his girlfriend. What should be an easy gig turns south when those cast as zombies start trying to eat the rest of the cast. Will they make it off the island before the zombies force Mason and Scarlet to join their ranks? I like Scarlet she's adorable even when things are going to their worst she still stays strong. Scarlet and Mason have this sweet undeniable chemistry but he has a secret that could change everything. Who doesn't love the idea of a zombie movie and the zombies turn into real life zombies they have an interesting origin story I never expected. 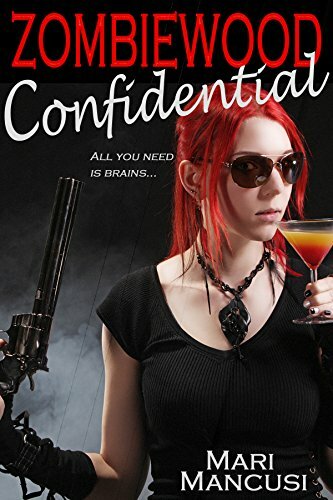 Zombiewood Confidential is a quick fast paced zombie book loaded with sweet romance and humor. I couldn't put it down I had to know how it would play out. I enjoyed every moment of Zombiewood Confidential but I wish it had been longer I wanted more of Scarlet and Mason. The author has done an excellent job weaving a captivating story with characters that are easy to connect with. Another wonderful story from the author she never disappoints.